Yesterday, I took the train to Manhattan along with the Honey Badger and his wrangler. We both had meetings with our agents, mine over an excellent lunch of barbecue at Blue Smoke, where Ginger and I plotted the downfall of western civilization, and also the next few books I’ll be working on. (It’s possible we should have reversed that order…) After lunch, I wandered over to meet up with Laird, Jessica, and Laird’s agent, Janet, who later treated us all to dinner at Max Brenner’s, which is a restaurant specializing in chocolate. Yes, you read that correctly. I’m happy to live where I live, but it’s things like Max Brenner’s that (occasionally) make me question my choice. From there, the Strand, where Laird and I were taking part in Grady Hendrix’s “Everything Is Terrifying” event, was a short walk. I haven’t been to the Strand in years, so I had forgotten that there’s a Forbidden Planet next to it. While Laird and Janet were responsible and went into the bookstore, Jessica and I ducked into FB, where I spent more time than I should have contemplating a life-sized model of Captain America’s shield and whether I could pull off wearing it on my back for the night’s festivities. I decided I couldn’t. Once in the Strand, Jessica and I were directed to the third floor for the event. That’s the rare book section of the store, where there is an enormous safe that’s like something out of Harry Potter. Emily, who was in charge of that part of the store, enumerated some of the safe’s contents for me, including an edition of Joyce’s Ulysses for which Matisse did a series of prints and which had been signed by both author and artist. That’ll set you back $47,000.00. I’m reasonably sure Cap’s shield would have been cheaper. The event itself was well-attended by a number of folks, some of whom I knew and was grateful to see, such as Jordan and Matt London, and Rick Bowes, and Kris Dikeman, and Todd Castillo, and Alyssa Wong–well, you get the idea. Grady Hendrix, resplendent in a brown corduroy suit-orange shirt and tie combination that he swore he was wearing un-ironically, gave each of us a deft, graceful introduction that made me wonder for a moment who this Langan guy he was talking about was, because he sounded pretty brilliant. Ellen Datlow started us off with a short story by Nicholas Royle she’d reprinted in Volume 3 of her Year’s Best Horror series. J.T. Petty delivered a brief talk about the importance of allowing our kids to experience fear. I read an essay, “Teratography,” which is about monster movies I saw as a kid (and which I’ve linked to on the left hand side, there, in case you’re interested). Laird read an essay about the horror of the wilderness. J.T. made a second appearance as his wife, Sarah Langan, who couldn’t be there, and read the beginning and part of the middle of a seriously creepy demonic-possession story. And then Grady wrapped everything up with a wonderful bit of storytelling that addressed the horror that is employment with a witty, frequently-hilarious account of his time in the employ of a temp agency in Los Angeles. While I’ve participated in a couple of podcast discussions with Grady, I’ve never heard him perform–a word I use deliberately–this way, and he was on fire. It was like a TED talk by a hybrid of Franz Kafka and Jerry Seinfeld. If you have a chance to see him speak, I would highly recommend not missing it. After that, it was back uptown to Grand Central and the train ride home, during which, Laird and I may have brainstormed fictitious radio commercials for Jessica to use in an upcoming project. The dogs were happy to see us when we stepped in the front door, and once I settled down to check my e-mail, I was happy to see an e-mail informing me I’d sold a story. So thanks very much to Grady Hendrix for organizing the evening’s festivities and so kindly including me in them. 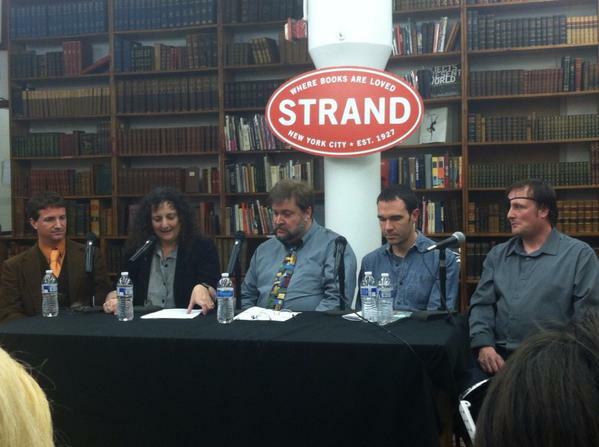 Thanks to the Strand for hosting us, and for the staff who helped the event to happen. Thanks to my fellow participants for being so brilliant, and for the audience for coming out to see us on a Monday night. The next couple of weeks promise to be somewhat busy. This coming Thursday, October 23, from 7:30-9:30pm, I’ll be taking part in the 27th annual H.P. Lovecraft Forum at SUNY New Paltz. This is an informal, annual event organized by the redoubtable Robert Waugh (whose two books on Lovecraft, The Monster in the Mirror and A Monster of Voices are required reading for anyone interested in serious scholarship of old HPL [in fact, I plan to do a post on them before too much longer, because they’re brilliant and great and more people should read them]). I’m probably going to be talking about an upcoming essay I’m working on concerning Lovecraft’s relationship to Poe, and literary influence in general. It’s on the campus of SUNY New Paltz, in room 1010 in the Jacobson Faculty Tower. If you’re interested, stop by for some good discussion. The following Monday, October 27, from 7:00-8:00pm, at the Strand Bookstore in NYC, I’ll be taking part in the “Everything is Terrifying” discussion/event. A raft of today’s leading horror practitioners, from writers Laird Barron and Sarah Langan, to editor Ellen Datlow, to director J.T. Petty, will be addressing the evening’s Halloween-themed title in a series of short talks. All of this has been put together by Grady Hendrix, whose new novel, Horrorstor, is about an evil IKEA (I kid you not). You can find more information about it here. If you can make it, please say hello. Finally, on Tuesday, November 4, from 7:00-9:00pm, at the SoHo Gallery for Digital Art in NYC, I’ll be reading with Nick Kaufmann for November’s New York Review of Science Fiction reading series. This reading is part of the ongoing festivities for the release of Nick’s new novel, Die and Stay Dead. There’s more information here. If you’re around, stop in and say hi. After all this socializing, it’ll be back to Castle Dracula for a long lie in the coffin and some spider cookies.